MUNICH, Germany, July 2, 2009 -- A German consortium led by Toptica Photonics AG of Munich has acquired bioimaging specialist Till Photonics GmbH from Agilent Technologies. The transaction concluded June 30; financial terms were not disclosed. Till, which like Toptica is based in Gräfelfing, Munich, was founded in 1993 as a systems provider for fluorescence microscopy used in basic research, applied science and medical diagnostics. Till’s microscope platform allows researchers to combine advanced fluorescence imaging techniques in order to gather better and more meaningful data from processes occurring in living cells, the company said. 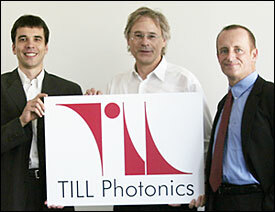 Till Photonics' new management team – Dr. Frank Lison, Dr. Rainer Uhl, and Dr. Thomas Weber – presents the new company logo. Till founder and previous owner, Dr. Rainier Uhl, is a member of the consortium that decided to buy the business from Agilent Technologies, which has owned Till since April 2008. Also participating was Toptica VP Research & Development Dr. Frank Lison, who will become CEO of the new company. The companies called their deal "a perfect fit." Toptica manufactures diode lasers and ultrafast fiber lasers for various markets. Its lasers are used in biophotonics and microscopy to help researchers using light microscopy techniques to gain a better understanding of the interactions within and between cells. “Till’s and Toptica’s business structures are very alike. Both companies are technology-driven, offer highly complex products and can claim technological leadership for more than one of their products,” Lison said. "Advanced optical and fluorescence techniques are indispensible tools for gaining better insight into structure and function of live cells in culture and tissue. Till's fluorescence microscopy solutions can be ideally combined with laser solutions. Actually the importance of lasers in microscopy - in life sciences in general - is steadily increasing. Supplemented with the similar company philosophies I can see a very good match, indeed," said Uhl, who is also a professor at Ludwig Maximilians University in Munich. The new management consists of specialists in biological imaging as well as business experts and will guide the now medium-sized company developing innovative imaging technologies to a market-oriented growth path, the companies said. Management plans to keep the name Till Photonics. "Notwithstanding the financial link to Toptica, the new Till Photonics GmbH will be operated as an independent entity with an independent organization and its own sales channels adapted to the microscopy market," said Dr. Thomas Weber, Toptica president. "Toptica sees itself in the role of a strategic investor who will use its entrepreneural experience to support the growth of the redirected company." "The strategic goal of Toptica, to become one of the leading laser suppliers for biophotonics, will not be affected by this acquisition. In fact, the present and future customers of Toptica can expect that the laser technology offered for microscopically imaging will enjoy an innovative push," said Dr. Thomas Renner, Toptica vice president of sales & marketing. "Through the regained operational degree of freedom within a smaller entity and the strategic support by Toptica will allow us to transfer the experience and skills of Till gained over the last years into the next level of products. I am looking forward to the joint work ahead," Uhl said. The new Till Photonics' product line will continue to be manufactured, sold, installed and serviced by the existing team of employees in Gräfelfing.